An entity that extends a Mapped Superclass class inherits the persistent state and mapping information from a superclass. You should use a mapped superclass to define mapping information that is common to multiple entity classes. A mapped superclass does not have a defined database table. Instead, its mapping information is derived from its superclass. To override the mapping information for a specific subclass, use the @AttributeOverride annotation for that specific class. A mapped superclass is identified by the @MappedSuperclass annotation. Open the Java class in the Project Explorer. Select the class in the JPA Structure view. In the JPA Details view, click the mapping type hyperlink to open the Mapping Type Selection dialog. 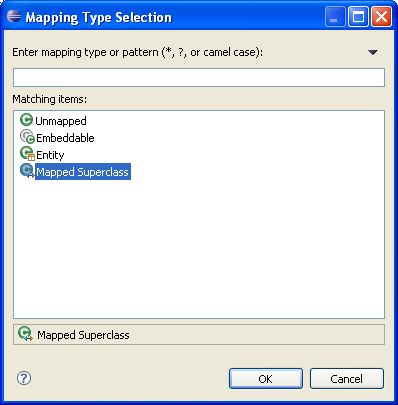 Select Mapped Superclass and then OK. Complete the remaining JPA Details view (for entities).